Published by almostaghost on February 20, 2012 in 2012 review and almostaghost. 0 Comments Tags: Bob Dylan, Carolina Chocolate Drops, Dave Matthews, Dierks Bentley, Eric Burdon, Evan Rachel Wood, Jeff Beck, Kris Kristofferson, Lucinda Williams, Marianne Faithfull, Maroon 5, Michael Franti, Mick Hucknall, Pete Seeger, Seal, Simply Red, State Radio, Taj Mahal, Thea Gilmore, We Are Augustines. One last disc of this, so far, surprisingly underwhelming collection. I certainly didn’t expect everything here to be good, but I was optimistic there would be more stuff blowing me away. Outside one or two so far, hasn’t happened. 1. Maroon 5 “I Shall Be Released”: I refuse to believe that a band as uncool as Maroon 5 is familiar and admires something as totally cool as Bob Dylan’s Basement Tapes. So I wonder, how did they know this song? Other covers? Some producer forcing them on it? 2. Seal & Jeff Beck “Like A Rolling Stone”: Well, I guess someone had to do this one. Why not Seal? Their version kind of sounds messy to my ears–raw vocals, Beck shredding all over the place. This is a tough song to cover, and I’m not sure it’s possible to get it right. 3. Carolina Chocolate Drops “Political World”: The coolest bluegrass/string band around takes one of Dylan’s newer songs and turns it into old-time music. Just like, I think it is safe to assume, Dylan always wanted. 4. Taj Mahal “Bob Dylan’s 115th Dream”: Old bluesman dives into one of Dylan’s more surreal, bizarre trips. Maha’s voice is an acquired taste, but he’s clearly an influence on Dylan’s more recent growly old blues vocals, and I imagine, if Bob Dylan were to recreate Bringing It All Back Home today, it would sound like this. 5. Dierks Bentley “Senor (Tales Of Yankee Power) (live)”: Bentley does a live version of this cool song. There’s a Willie Nelson version of this song which, while also in the country vibe, is much more skilled. But if you like traditional country/bluegrass, this taps into that fairly well. 6. Mick Hucknall “One Of Us Must Know (Sooner Or Later)”: The lead singer of Simply Red jumps in the crowd, and tries what has lately been my favorite Dylan song ever. (That changes a lot, of course.) It’s pretty tame, but Hucknall’s voice is good, and this is not one that gets covered enough. 7. Thea Gilmore “I’ll Remember You”: Gilmore years ago released a great cover of “I Dreamed I St. Augustine,” which eventually led to her putting out an entire cover of the whole John Wesley Harding album. It is a pretty sweet release (my 51st favorite album of 2011), and she obviously is a big fan, and it is nice to see her included here. 8. State Radio “John Brown”: Don’t know this band, but Wiki lists their genres as “alternative rock” and “reggae.” Don’t have high hopes for that combination, to be honest. While the affecting story of the song gets slightly lost in this version, State Radio does drastically change the song–melody/rhythm/everything–and for that, they get some credit. 9. Dave Matthews Band “All Along The Watchtower (live)”: a 7-minute Dave Matthews live jam? No comment. 10. Michael Franti “Subterranean Homesick Blues”: Was excited to hear a rapper attack “SHB,” one of the forerunners of rap, with it’s stream of images and phrases. I didn’t really like Franti’s version, I found myself wishing it had more typical hiphop beats. But he is definitely having a fun time performing this, and who wouldn’t with those lyrics? 11. We Are Augustines “Mama, You Been On My Mind”: These guys are a pretty standard rock band; I checked them out for my upcoming Coachella trip and was not overly impressed. They tap into this amazing song, and do a nice job, though. 13. Kris Kristofferson “Quinn The Eskimo (The Mighty Quinn)”: You know, it’s about time that someone covered “Quinn The Eskimo” again and had a big joyous hit song. Kris Kristofferson probably isn’t the right guy for that though. He makes it sound sad, which is an interesting choice. 14. Eric Burdon “Gotta Serve Somebody”: I had no idea Eric Burdon was still around. 15. Evan Rachel Wood “I’d Have You Anytime”: Actress Evan Rachel Wood makes one of the more unlikely picks for this, doing a song that Dylan cowrote with George Harrison, and is on Harrison’s epic All Things Must Pass. OK! She turns it into a smoky jazz nightclub type of song too. Cool. 16. Marianne Faithfull “Baby, Let Me Follow You Down (live)”: Faithfull attacks this blues song vocally, which doesn’t quite fit with the banjo picking that makes up the music. Her voice is strong, but the music is fragile. 17. Pete Seeger “Forever Young”: Well, how can we get even older than Marianne Faithfull? Pete Seeger! But he’s a great ending for the collection: he still has a vibrancy and the joy in this song is awesome. There is also a Bob Dylan song after Seeger (“Chimes Of Freedom” of course), but that seems irrelevant by this point. Quick note: this fourth disc was probably my favorite of the four. This was an odd collection of popular musicians, young and old, of quite a few different styles. If you like diversity, I definitely think it’s worth at least listening through on the Amnesty website. 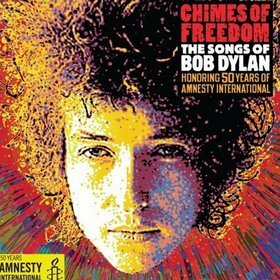 Even if you’re not familiar with ALL of these Dylan songs, the collection comes off as adventurous just because of the sheer diversity present. And that, I think, above all the numerous reasons, is one of Dylan’s most amazing genius.